Specially designed for the normally active adult dog. High-quality chicken meal is the primary ingredient. It is combined with high-quality chicken fat. That makes PRO PAC ® Adult Chunk and Mini Chunk formulas highly palatable and easy to digest. The superpremium nutrients in PRO PAC ® provides for: Strong bones, Excellent muscle tone, Shiny coat, and Firm, consistent stools. PRO PAC ® Adult Chunk formula and PRO PAC ® Mini Chunk formula have the same complete nutritional content. They contain no by-products and are naturally preserved. 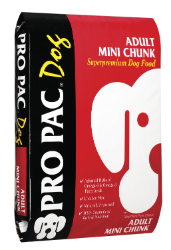 A standard 8-ounce measuring cup holds approximately 4 ounces of PRO PAC ® Dog Adult Chunk and Mini Chunk. Chicken Meal, Ground Yellow Corn, Chicken Fat (preserved with mixed Tocopherols, a source of Vitamin E), Rice Flour, Dried Beet Pulp, Natural Flavoring, Flaxseed, Yeast Culture, Salt, Potassium Chloride, Choline Chloride, DL-Methionine Hydroxy Analogue, L-Lysine, Vitamin E Supplement, D-Activated Animal Sterol (source of Vitamin D3), Vitamin A Acetate, Niacin, D-Calcium Pantothenate, Biotin, Vitamin B12 Supplement, Riboflavin Supplement, Thiamine Mononitrate, Ascorbic Acid, Pyridoxine Hydrochloride (Vitamin B6), Folic Acid, Manganous Oxide, Ferrous Sulfate, Copper Sulfate, Zinc Oxide, Calcium Iodate, Zinc Proteinate, Manganese Proteinate, Iron Proteinate, Magnesium Proteinate, Copper Proteinate.